While the bulk of Nintendo’s efforts were focused on the Wii U launch last year, the company did manage to almost silently launch a smaller (and extremely bare bones) version of the Wii, the Wii Mini, in Canada a few weeks before the Christmas holiday. At the time, Nintendo would only confirm the launch of the system in Canada, but we are now seeing signs that it might also head to Europe at some point. 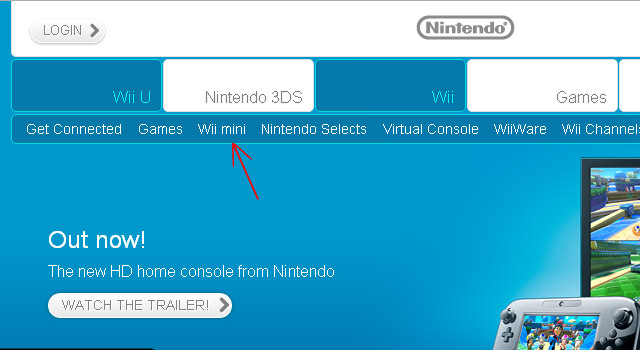 As spotted by NeoGAF user “Qurupeke“, Nintendo has updated their official UK website to show a link to a Wii Mini page. Interestingly, the actual link itself is broken and clicking on it takes you to a 404 – I AM ERROR page (which, on a side note, is maybe the greatest 404 error page that I’ve ever seen). Nintendo of Europe has not announced the launch of the Wii Mini, and a search of the company’s U.S. site turned up a big goose egg. The best thing to do for now is to consider a worldwide launch for the ultra-tiny console as nothing more than speculation. Now, in the hypothetical event that the Wii Mini does break out of the confines of Canada and spread itself across the world, there are a few things that you should know about the console before slapping your hard earned cash down on the retail counter and stating in a commanding voice, “Hand me one of those Wii Mini consoles, good Sir!”. First the good news. The Wii Mini is indeed very small, and has a nice almost reto-look to it. It also carries a slightly smaller $99 price tag. And, that about does it for the good news. The biggest downside to the console is that there is no Internet connectivity options, which means no; WiiWare, Virtual Console games, Wii Channels, Hulu Plus, Netflix, multiplayer games, or patches (yes a few Wii games did have patches). Additionally, there are no GameCube controller ports or SD card slots (which means no game save transfers). Basically, the Wii Mini just plays offline disc-based Wii games and looks kind of cute. We will keep an eye out for any official confirmation of the Wii Mini‘s launch plans outside of Canada and let you know if anything turns up. [Update] Nintendo has officially announced the Wii Mini launch in the UK.